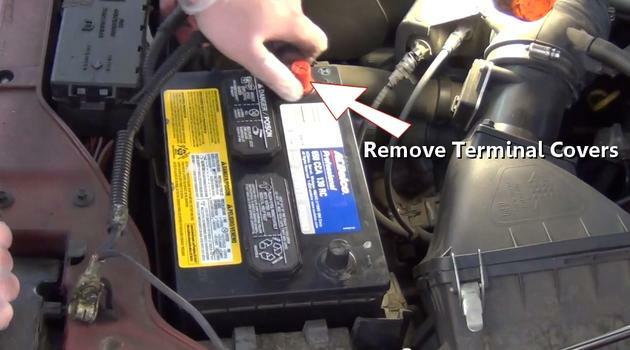 When a battery goes bad it can expel acid around the battery, battery box and cables. This acid is corrosive and you don't want to get it on your clothes or skin. It's a good idea to wear rubber gloves like you would use to clean your household oven. Also, put on safety eyewear and old clothing. By sprinkling baking soda over the battery and then rinsing it with water will help neutralize the acid and clean the area before work begins. Though appearances may vary slightly for each car the process is virtually the same. The battery location will be under the hood in most cases but some cars may have it in the trunk or under the rear seat. Record the radio stations for re-entry as they will be lost once the electrical power is disconnected. 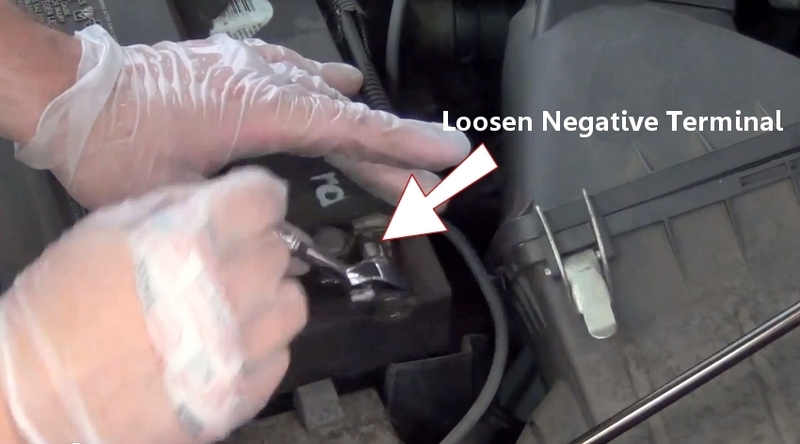 Using an 8mm or 10mm wrench to loosen the bolt for the negative cable end. You might need to give a twisting motion to help remove the cable. Be careful not to touch the wrench to the positive side of the battery to avoid a short circuit. Always undo the negative side first because the positive side is more prone to shorting to ground via any metal in the area. Then push the cable away to avoid it accidently coming back and reconnecting to the terminal. Next, undo the positive side cable this will normally be a red color and identified by a positive sign near the terminal connection. Use a wrench or ratchet to loosen the cable end. At this point there is no chance of creating a short circuit because the circuit is no longer live with the disconnection of the negative cable. Some manufacturers have a battery cover which now can be removed once the cables have been disconnected. This will also allow you to gain access to the battery hold down bolt. This cover should be cleaned before re-installation with water and soap to remove any acid residue that might be present. 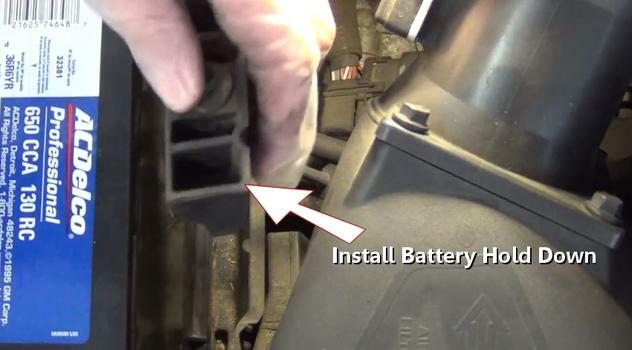 Locate the hold down bolt or J bolt nuts which are either at the top or bottom of the battery mounting box. 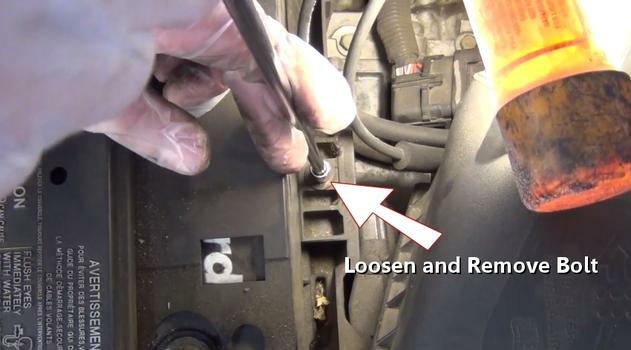 If the hold down is at the bottom it with only require one bolt to be removed while a J bolt style of mount will require two nuts to be removed. 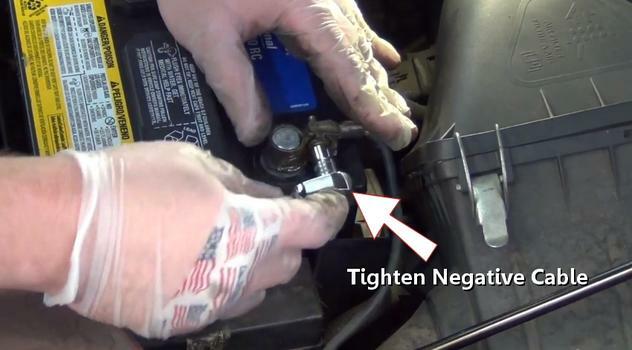 On a bottom bolt style of mount use a long extension and ratchet to help in the removal. These bolt sizes include 8mm and 10mm. There will be a plastic wedge piece that will also need to be removed as well. After moving the bolts and hardware and while still using gloves grasp the battery and wiggle it slightly to break it loose from its mount. Then hold tight as you lift the unit from the vehicle. Brace your knees and back for this step due to the weight of the battery. 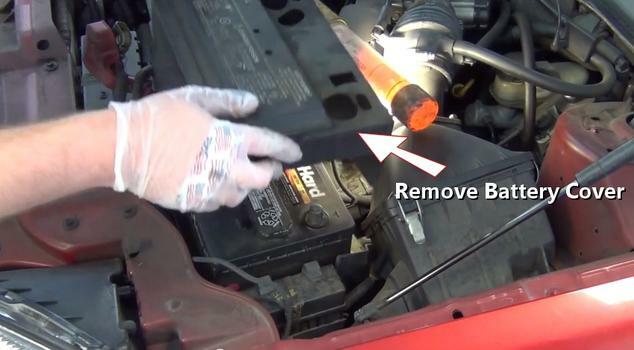 Once the battery has been fully removed use a garden hose to fully wash the area free from acid. This will also prevent corrosion of metal pieces and wiring which could be routed below the battery box. Now that the old unit has been removed compare it to the new battery while checking the size, terminal position, cold cranking and reserve amps which should meet or exceed the old battery. While firmly holding the new battery, gently lower it into position. Be mindful of the terminal orientation so the electrical cables will attach to the corresponding positive and negative cable. Once the new unit is in place wiggle it to ensure it's down into the box mount then lower the mount wedge and bolt into place. This wedge should only be installed in one direction with the stepped part toward the batteries side wall. Wash these parts with soap and water to remove corrosion before reinstalling them. After the hold down has been lowered into position tighten the bolt securely. At this point you should see and feel the battery get tight within the battery box. 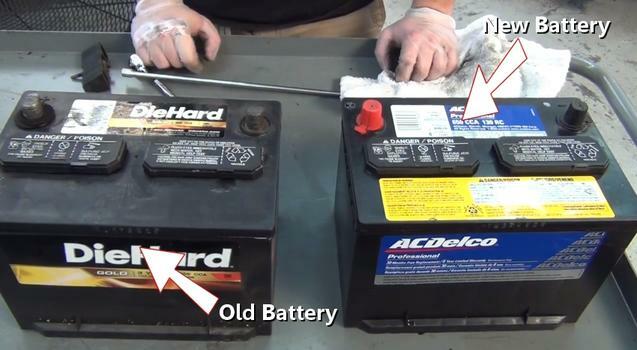 Remove both terminal covers of the new battery which are used to prevent damaged and shorting while in shipping. The terminals should now be clean and ready for the positive and negative cable to be installed. Set the cover back into place before the cable installation. 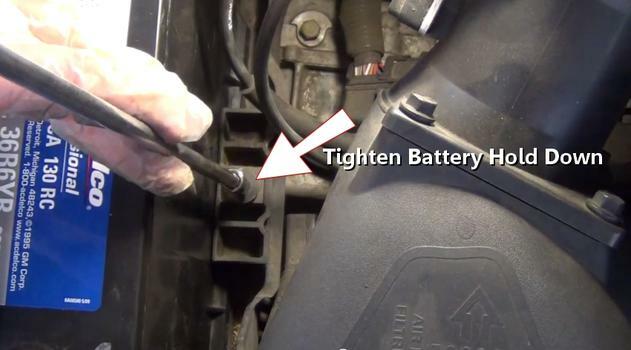 Use a cleaner tool with a twisting motion which will create a fresh metal surface within the cable end to aid the transfer of amperage needed to run the car. Take note this cleaner has a taper fit and will only work correctly in one direction. Complete this operation by cleaning both negative and positive cable ends. A small wire brush will work for this as well. 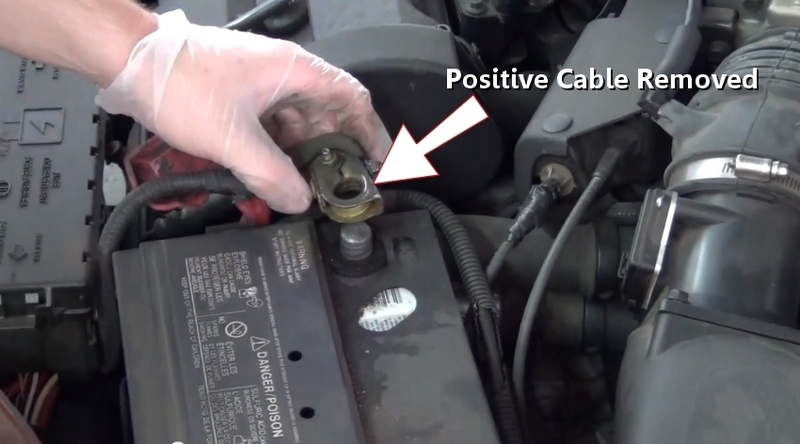 Install the positive cable first, tighten the nut while holding the end downward to help the connection. To ensure a proper installation wiggle the cable end slightly. 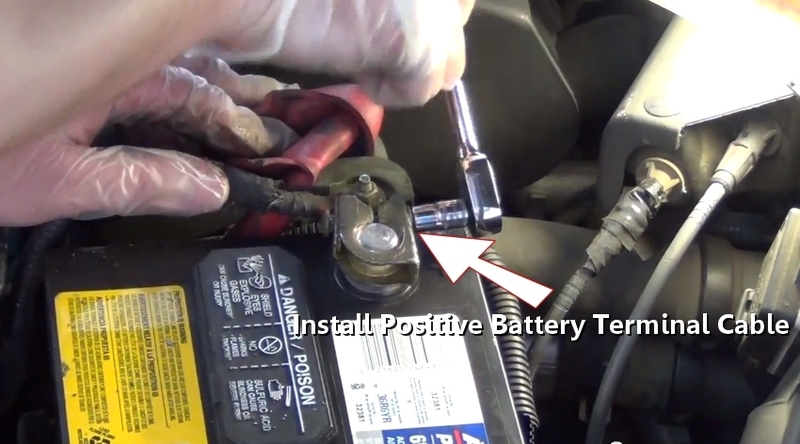 Never attach the positive cable to the negative side of the battery or the negative cable to the positive side. 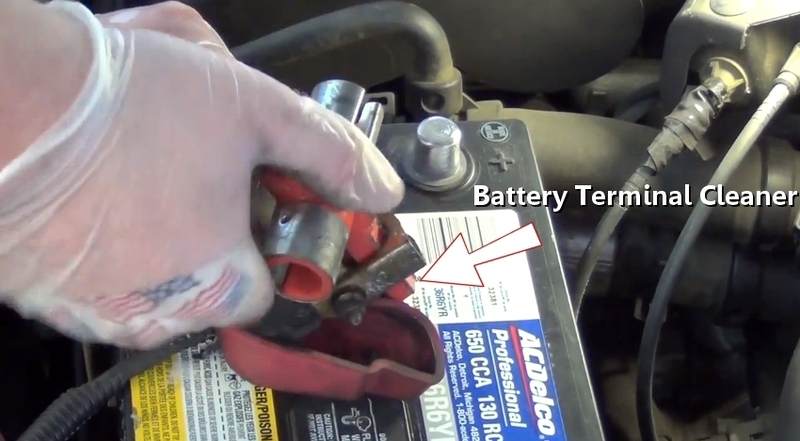 This will cause major electrical problems such as shorting out the alternator, main computer or other controllers inside the vehicle. Once tight reinstall the positive cable protective cover. 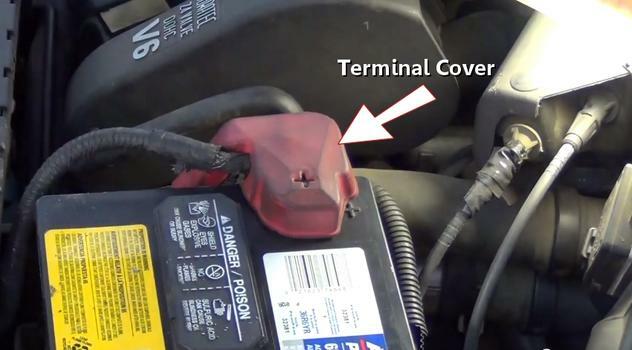 This cover helps prevent accidental short circuits when working inside the engine bay. Finally install the negative cable end onto the battery terminal and tighten while holding downward. Check the cable end for tightness by giving it a twisting motion. Wipe away any dirt or metal shavings from the cable end cleaner and double check your work and you are all set. Once the replacement is complete it's a good idea to check the alternator voltage output using a voltmeter. 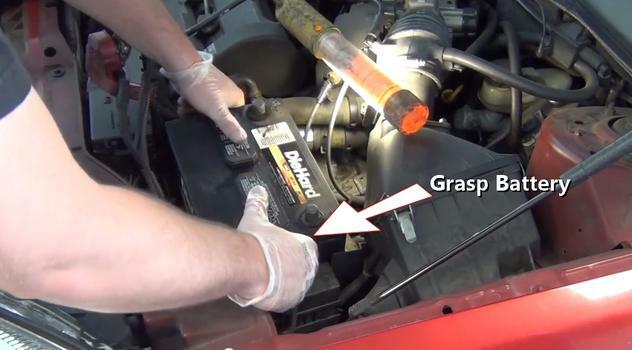 Also observe the electrical system warning light or gauge this will ensure the operation of the alternator. 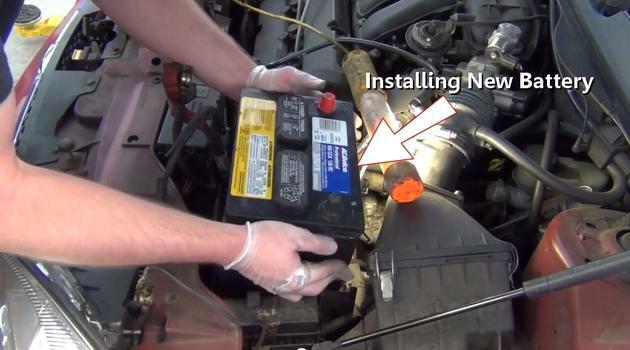 Watch our video which gives you an idea on what you are in for when replacing your car battery.